Kerns is a neighborhood in the inner Northeast and Southeast sections of Portland, Oregon. 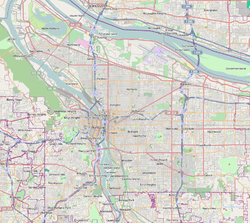 It borders the Lloyd District and Sullivan's Gulch on the north, Laurelhurst on the east, Buckman and Sunnyside on the south, and (across the Willamette River) Old Town Chinatown on the west. Parks in Kerns include Everett Community Garden (1988), Buckman Field (1920), and Oregon Park (1940). 28th Avenue's popular restaurant scene brings a great deal of business into the neighborhood. Tabla, Pambiche Cocina and Repostería Cubana, and Navarre are three notable restaurants of many which operate on this street. Screen Door, a restaurant which has been featured on the Food Channel and consistently has long waits for a table, is located on East Burnside and 23rd in the Kerns neighborhood. Sunshine Dairy, founded by Greek restaurateur John Karamanos in the mid-1930s, is located in the Kerns neighborhood on NE 21st Avenue and Oregon Streets. Sunshine Dairy also runs its sales and marketing out of the Fire Alarm Dispatch (FAD) building, which, in 1928 was constructed solely for use as a communications headquarters at NE 21st and Pacific Avenue. Portland Public Schools include Benson Polytechnic High School and da Vinci Arts Middle School. Pacific Crest Community School also resides within the neighborhood. ^ Paraskevas, Cornelia. "Greek Community in Oregon". The Oregon Encyclopedia. Retrieved 29 October 2015. ^ "Firefighting in Portland Through the Years "Cool Equipment for Hot Emergencies"". City of Portland website. Retrieved 13 November 2015. This page was last edited on 5 December 2018, at 12:45 (UTC).